Marvel Comics did not exclude themselves from the blaxploitation fad of the 1970’s. The publishing giant made sure they didn’t miss out on the trend when Archie Goodwin and John Romita, Sr. created Luke Cage in the pages of the new title Luke Cage, Hero for Hire in 1972. While not being the first black Marvel character to star in a book, he was their first to receive his own eponymous title, and only the second in the industry as a whole following Lobo of Dell Comics. There wasn’t much originality to Luke at first. He was written as stereotypically as a black man can be depicted back in those days. Sporting an afro with thick sideburns and a colourfully bright yellow shirt, Luke looked more like a Motown Live dancer than a superhero. His dialogue didn’t exactly help, always yelling out exaggerated slang such as “Sweet Christmas!” But this was during a time when “Walloping Web-Snappers” was Spider-Man’s catchphrase. So really, we can’t dog on Luke’s quotes. Luke was set up by his drug dealer former best friend and was sent to Seagate Prison for a crime he was innocent for. There, he was offered a chance for parole if he accepted to undergo a procedure which was originally intended to cure illnesses. The formula was a derivative of the super soldier serum which created Captain America back in WWII. 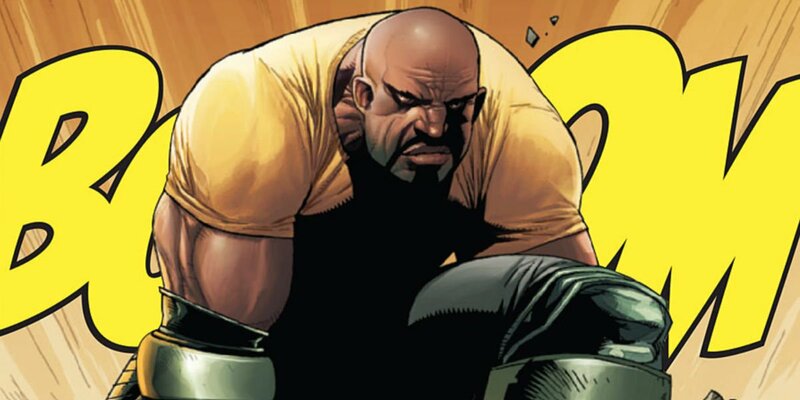 The procedure was tampered with by a crooked prison guard with the intention to kill Luke Cage. Instead, it granted the volunteer with super strength and unbreakable skin. It didn’t take long for Luke to use his newfound powers to break out of prison and head to the Big Apple. There, Luke conjured up an idea that no other hero thought up before, or never had the grapefruits to do. While every other spandex clad individual was morally bound to save the day, Luke opted to charge his clients for his services. Thus, he became the Hero for Hire. You pay him his rate, he solves your problems. He gained the nickname of Power Man. The name was self explanatory. With time, Luke’s popularity waned. Meanwhile, another obscure hero, Iron Fist, also had his own title about to be cancelled. But Marvel Comics thought that if they were to join these two together, they might prolong their relevance. It proved to be a smart decision, as Power Man and Iron Fist became a popular title. 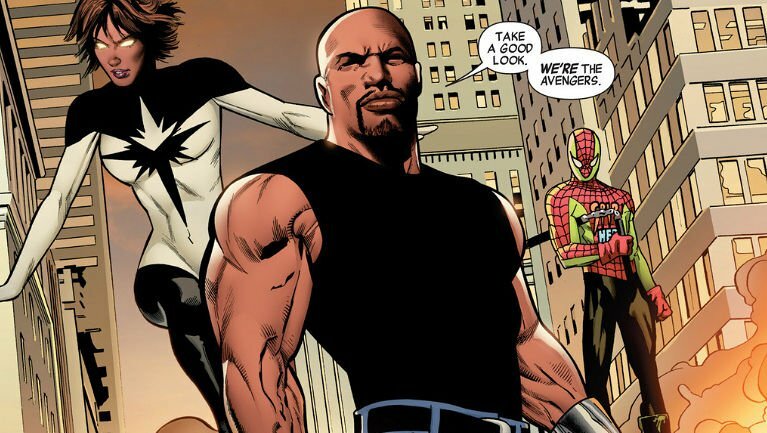 The duo continued the hero for hire concept and even expanded their enterprise, turning it into a legitimate business in the pages of the aptly titled Heroes for Hire. But still, Luke Cage was not considered a major player. His status would often change from solo, to duo, to team hero; from New York to Chicago as base of operations; from discoesque to street thug as characterizations. While groundbreaking as a creation back in ’72, he wasn’t exactly breaking out with all the reinventions. But bright days were still ahead. A major step in Luke’s character career was when writer Brian Michael Bendis decided to take Cage and catapult him up the ladder. When the Avengers disbanded in ’04 (thanks to Bendis), a New Avengers book followed (thanks to Bendis, again). This new line-up of the Earth’s Mightiest Heroes included the Power Man. Fighting alongside major players like Captain America, Iron Man, and Spider-Man helped put the spotlight on Luke, who was also being written more sophisticatedly. He fell in love with Jessica Jones, a former superheroine turned private eye turned investigative reporter and together, wed and had a baby son. Finally, Luke Cage was successfully brought to the forefront. No, he does not stand next to Spidey, the X-Men, or the Fantastic Four in terms of popularity status. But Bendis has turned Luke from an obscure C-Lister to a major gun, being featured in every major crossover event Marvel has published in the last several years. 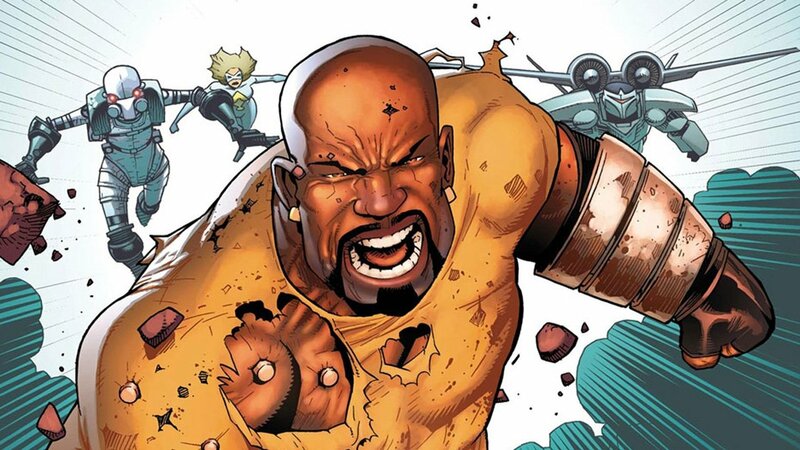 After four decades on our shelves, going through many transformations and reinventions, Luke Cage is finally among the top of the Marvel Universe. A strong cat, a cool cat, a bad mother-shut yo’ mouth! This article originally appeared in the CGM May 2012 issue.